During this time of year everyone wants to make predictions on who will win the Super Bowl. 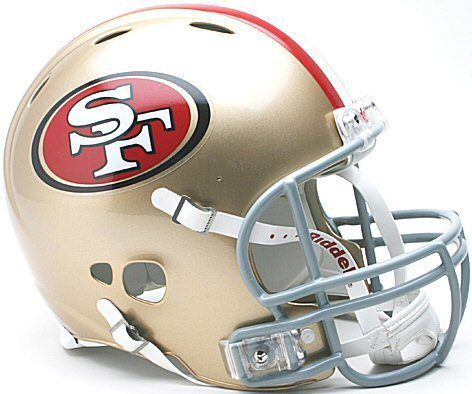 I am here to tell you, that this year's Super Bowl champions will be the San Francisco Forty-Niners. The reason is simple. They are the only team left in the play-offs that has stripes down the middle of their helmets. Here are some stats to prove my point. In the 46 Super Bowls that have been played thus far, 38 of them have been won by teams with stripes down the middle of their helmets. Only 8 times has a team won the Super Bowl and not had stripes down the middle of their helmet. New England won 3 of those 8, but oddly enough, all 3 of those victories came against other teams without stripes down the middle of their helmets. New England has NEVER beaten a team with a stripe down the middle of their helmet in the Super Bowl. There have been 20 Super Bowls which matched up one team with a striped helmet and one team without stripes. Only 3 of those 17 games have been won by the non-striped helmet team. The Chicago Bears beat the Patriots (in the old Patriot uniform which had stripes,) the Ravens beat the Giants, and the Bucs beat the Raiders. The 5 other times a non-striped helmet team has won the Super Bowl, it was versus another non-striped helmet team. St. Louis beat the Titans, The Patriots beat the Panthers, the Rams, and the Eagles, and the Chiefs beat the Vikings. There are 11 franchises in NFL history who's teams have won more than one Super Bowl. Guess how many of those 11 franchises have stripes down the middle of their helmets. The answer is 10. Only the New England Patriots have won more than one Super Bowl AND had a helmet without stripes down the middle. So you see, if you want to win the Super Bowl, the first thing you should do, is put at least one stripe down the middle of your helmet. And actually, stats would say to put only 1 stripe, since the Pittsburgh Steelers have won the most Super Bowls, with six, and they sport one thin yellow stripe down the middle. However, the teams who have won four or five each have three stripes. The 49ers and Cowboys each have five wins, and the Giants and Packers each have four.